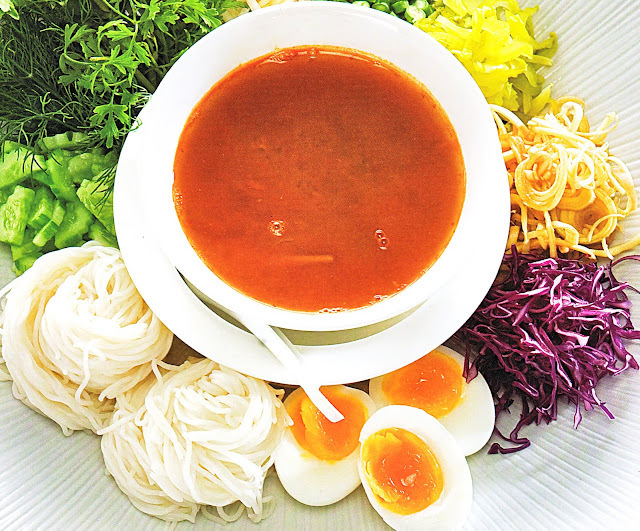 Kha-nom Jeen Nam Ya Par or "Thai fresh rice noodles with Thai fish curry sauce" A dish most commonly known in the northeastern I-san region of Thailand, fresh rice noodles with Thai fish curry sauce style of food is traditionally served in large quantities for whole families. Variations can be seen in the way minced chicken is used instead of fish, or how some people prefer a vegetarian alternative with crunchy vegetables and alternative to fish sauce. A very versatile choice of food, Kanom Jeen Nam Ya Par is often served with a side dish of vegetables consisting of pickles sour mustard, bitter melon, water spinach(morning glory) and plenty of green beans and beansprout, which are mixed into the noodle and sauce to create a smooth yet crunchy combination of flavors. 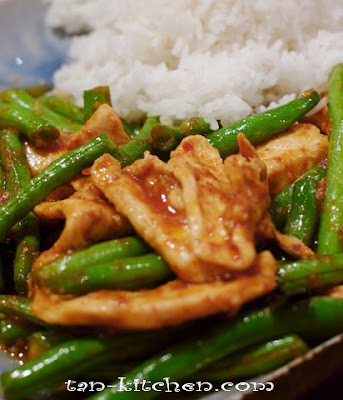 Stir-fried chicken with red curry paste and long green bean that made easy to find. In Thailand we called “Gai Pad Prik Khing” This is easy to make and it’s easy to find as a street food in Thailand. Heat oil in a wok over medium heat, then add red curry paste. Stir fry until aromatic. Add chicken and stir fry until nearly cooked (about 3-5 minutes). Then add string beans (or vegetables that you choose), fish sauce and sugar. Stir fry until vegetables nearly cooked, then add sliced kaffir lime leaves, and stir fry for another 30 seconds. Transfer to a serving dish. Garnish with coriander leaves and serve immediately with hot steamed rice. 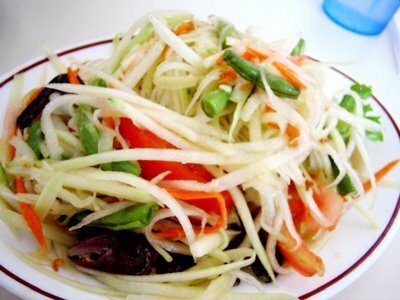 Green papaya salad is a Northeastern Thai / Lao / Cambodian spicy salad made from shredded unripe papaya. Locally known as som tam. it was listed on World's most delicious Thai foods. The dish combines the four main tastes of the local cuisine: sour lime, hot chili, salty, savory fish sauce, and sweetness added by palm sugar. The ingredients are mixed and pounded in a mortar; the Thai name som tam literally translates as "sour pounded". Despite the use of papaya, which one may think of as sweet, this salad is actually savory. When not yet ripe, papaya has a slightly tangy flavor. The texture is crisp and firm, sometimes to the point of crunchiness. It is this that allows the fruit to withstand being beaten in the mortar. In Thailand, it is customary that a customer ask the preparer to make the dish suited to his or her tastes. 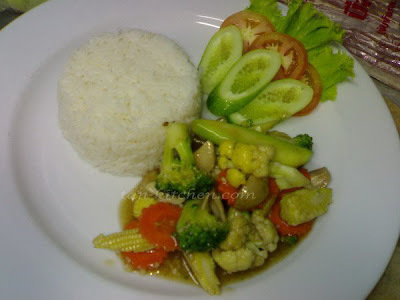 To specifically refer to the dish as prepared traditionally in Laos or Isan. Hello! My name's Tan's Tan is an Hotel Executive Chef. 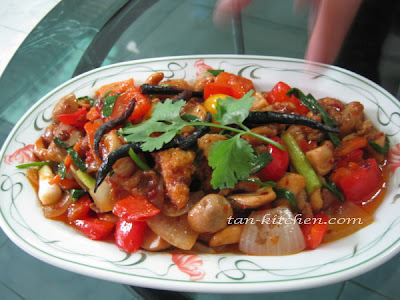 Tan cook and write Thai food and Thai dessert recipes in English. Planning write in Thai soon. Copyright @ 2007-2019 tan.wiratchada all right reserved.